I unearthed a couple of bento pictures I took over a staggered timeframe between last year and a month ago. I honestly can’t remember some of the details, so let’s just go through all of them in one post. 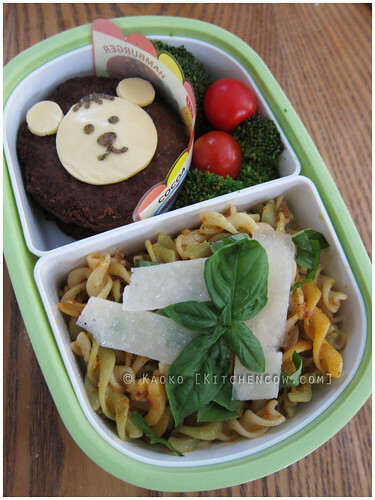 Bento with hamburger patties topped with cheese masquerading as a bear, sundried tomato pesto on fusilli sprinkled with shaved parmesan and fresh basil, and a side of steamed broccoli and cherry tomatoes. 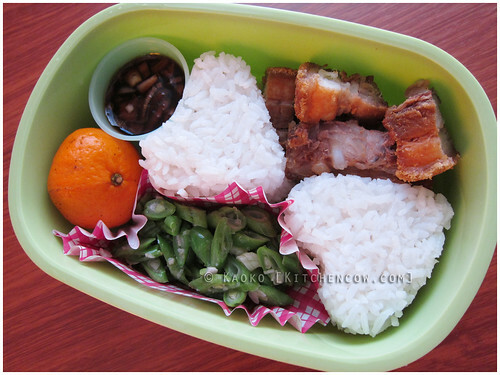 Bento with bagnet, onigiri-shaped rice, green beans sauteed in olive oil and garlic, and a small kiat-kiat orange. The sauce in the corner is a dipping sauce of soy, vinegar and onions—for the bagnet. How do I keep the sauce intact? Tautly-pulled cling wrap is the kay. Bento with crispy adobo flakes (with sauce in the tiny elephant head sauce bottle), rice with an umeboshi (Japanese pickled plum) on top, mango cubes, and a salad of diced tomatoes and feta cheese. It’s hard to believe that these are all I have to show for months. I guess the need to sleep longer in the mornings has become more important than packing lunch. It’s a situation that must be remedied but frankly, I don’t know if I can manage. I mean, it’s sleep, glorious sleep! ZZZZZzzzzzzzzzz…. well i salute you for being able to come up with these cute bento boxes on the first place… i dont think ill be able to have the patience and creativity in coming up with a cute looking sandwich much more a bento box! way to go chrissie!! All you need is a little time. Maybe if you’re preparing lunch for Paul instead of yourself, you’ll be more inspired, heeheehee. I miss them too! Need moar time. I should say less sleep but I like sleep to, so moar time instead. nice bento boxes! 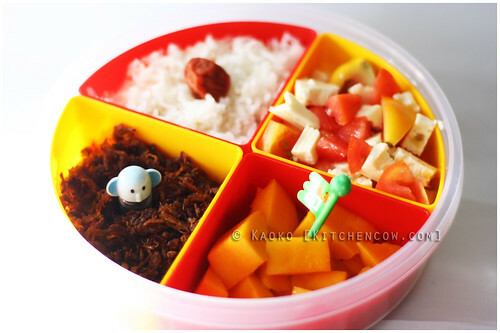 im always amazed at how creative your lunch box looks! They come in different animal forms! I think I got the safari set so it included an elephant, a tiger, a panda and a couple more I don’t remember right now. Hi Cindy! Most of them are from Saizen, Daiso and Japan Home Center. Don’t lose hope, just come back on a different day. Their stock cycles and the inventory changes frequently. Actually, I do have plans to unload some unused stocks but I still haven’t gotten around to them. Hopefully, I’ll get to sort them soon.